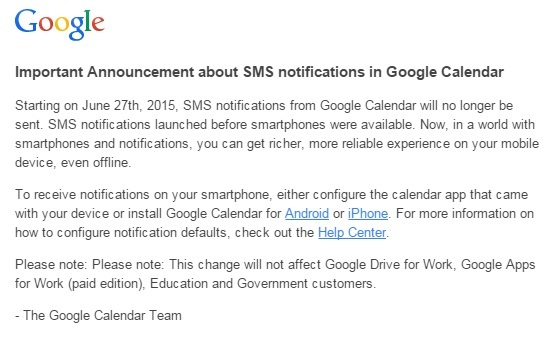 Google is sending out an email, notifying all Google Calendar users that SMS reminders no more. 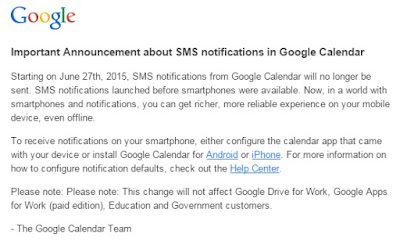 "Starting on June 27th, 2015, SMS notifications from Google Calendar will no longer be sent. SMS notifications launched before smartphones were available. Now, in a world with smartphones and notifications, you can get richer, more reliable experience on your mobile device, even offline. - The Google Calendar Team"
Personally, I'm happy to see this. Calendar entries always seemed to default to SMS, and I preferred the notification on my phone or tablet, as it is easier and faster to clear.